Today marks exactly three months of chronicling Coppertop gardens! 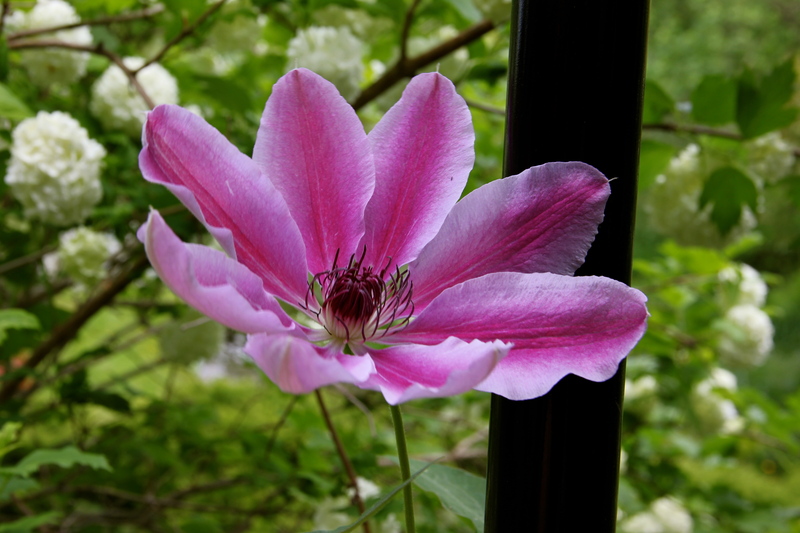 Our surroundings have changed a huge amount during these months, most noticeably by greening, blooming, and filling out. Hubby and I were chatting about how the leafing out of trees and bushes has dramatically changed the look and feel of our home; sometimes we feel as if we are in a lush grotto or perhaps a treehouse of some sort. Living within a green, glowing landscape offers a sense of serenity, and we’re also thankful for the expanse of sky and the vistas that draw the eye up and outward. 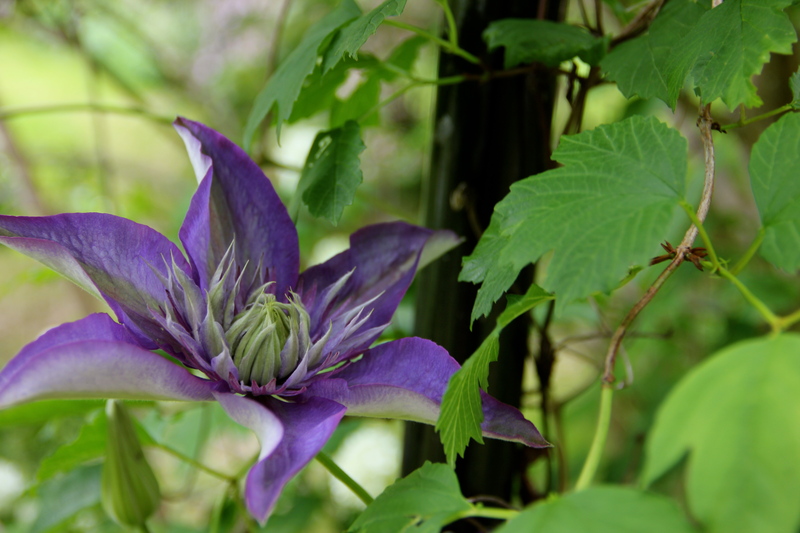 More of the abundant clematis vines are beginning to flower. The blooms are spectacular. This week I’ve spotted some new birds, which is always exciting for me. Among the many American goldfinches, which are very difficult to capture on film, these red headed finches have appeared. As we prepare to hold a large party here this weekend, there’s much to accomplish, including the perpetual garden clean up. I have plenty of flowers to cut and bring inside, so I won’t need to buy any bouquets! 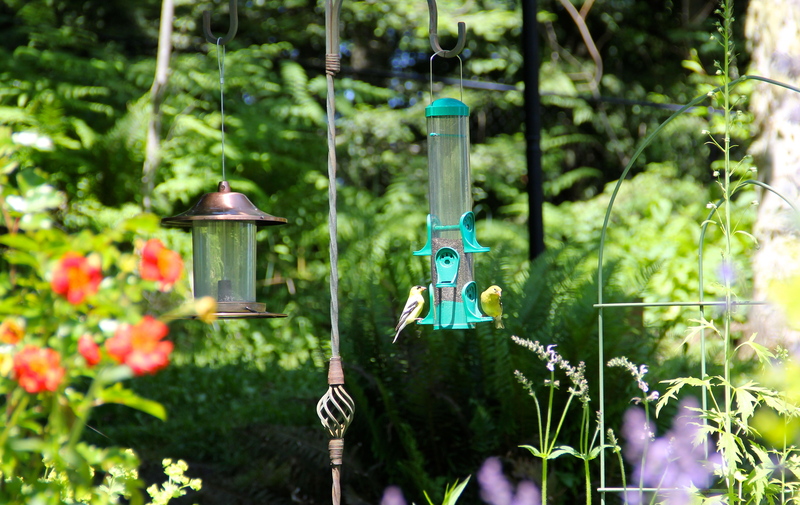 Update: I realized Son captured a great photo of two goldfinches at the thistle seed feeder. He must sit more still than I do. 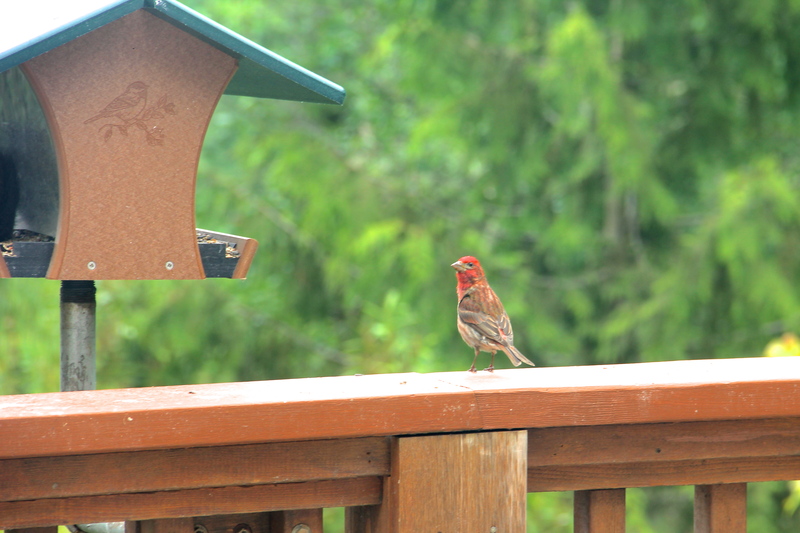 Update in mid June: Most definitely the red-headed birds are House Finches! This entry was tagged clematis, Coppertop, finch, gardening, goldfinch, house finch, Olympic Peninsula. Bookmark the permalink.